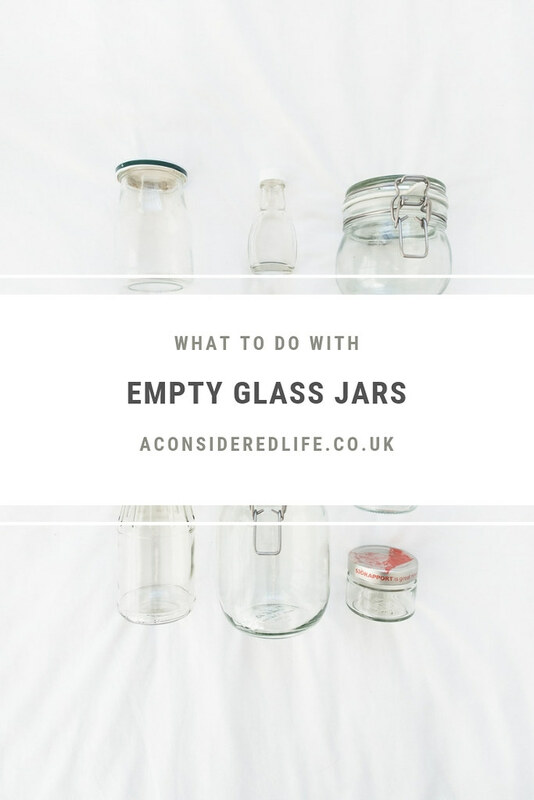 When I started getting into the low waste lifestyle, I found myself with a cupboard full of empty jars and not a single clue of what to do with them. The more I learned about low waste living and the little ways we can reduce our waste I realised just how useful having a stockpile of jars to hand really is. It’s far better to repurpose than recycle whenever possible. Recycling requires a lot of resources and despite our good intentions, the things we put in the recycling bin might not end up being recycled at all. Saving what we can and putting it to good use elsewhere is a better solution. If you open my pantry you’ll find nuts and seeds, oats, rice, and noodles stored in a variety of glass jars. Open the fridge and you’ll see a similar theme; tofu being marinated, homemade dressing being stored, leftovers being preserved. I even repurpose jars as vases and for propagating plants. I’m kicking myself for sending so many jars to be recycled! There are countless ways we can repurpose jars. 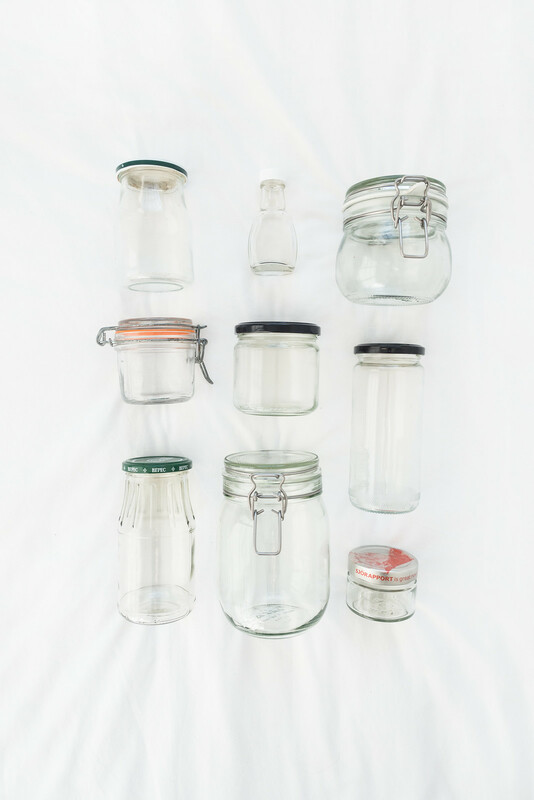 This post will show you how to prep your empty jars and then put them to good use. Hopefully you’ll discover some new ways to use them and please do share how you use yours in the comments. Some labels slip off easily when run under hot water, others are a little more stubborn. If you find yourself with a label that refuses to budge, it’s easily removed with a simple DIY remedy. Mix together a little bicarbonate of soda with oil and spread over the patches of sticky residue left by the label. Leave this to work its magic overnight, in the morning you’ll find the whole lot washes off and you have a clean jar ready to use. Particularly stinky contents will leave jars smelling a little funky. Decanting anything into these less-than-fresh jars will result in peculiar tasting food. Smelly jars are easily remedied with a little vinegar or baking powder and water. I like to fill my empty jars with a dash of vinegar topped up with cold water. Screw the lid on tight, shake, and let it soak. Rinse after a couple of hours and you’ll find the jar has lost its smell. I’ve heard baking powder and water can do the trick too. Pantry Staples. 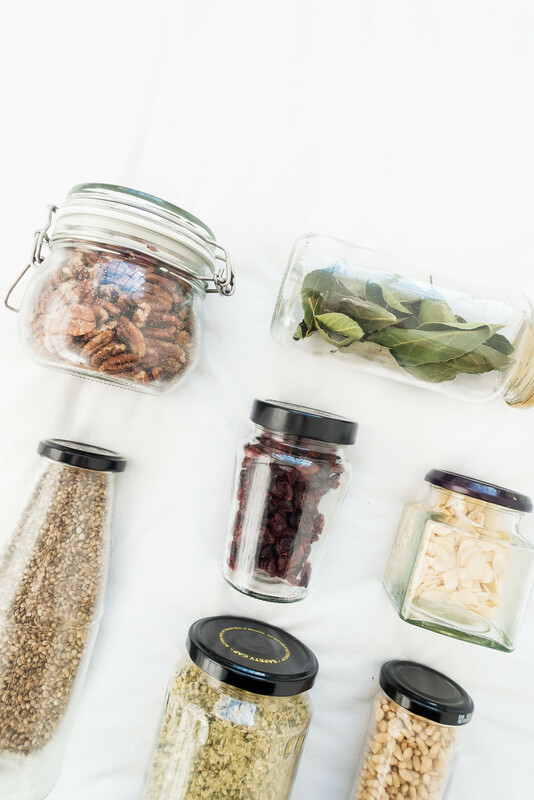 The most obvious way to repurpose jars is to use them as storage for pantry staples. They’re perfect for items you buy in smaller quantities, like nuts and seeds, and for any odd amounts leftover from cooking. Prepping Food. There are lots of ways you can use jars to prep and serve food. I like to use them for mixing dressing and marinading food. You can also use them to make overnight oats, puddings, and pickles. Leftovers. Jars are super useful for preserving leftovers. Chopped veggies from salads, cooked beans, half an avocado; whatever you’ve got that needs to be eaten can be popped in a jar and saved for later. Serving Food. Don’t have a fancy tin to store your lunch in? Use a jar. All kinds of food can be stored and served in a repurposed jar, and taken with you to work or on day trips. Coffee and Tea Storage. Jars are a great tool for storing coffee beans or grounds and tea leaves. I collect my tea leaves from a bulk store using a jar and it helps keep the contents fresh and easily accessible in my cupboard. Cutlery Or Utensil Holders. Pop your kitchen utensils or table cutlery into a jar and you have a simple holder that didn’t cost you any extra. This works especially well with smaller items like peelers, pastry brushes, and deseeders. Small Item Storage. If you have loose matches, elastic bands, pencils, buttons, or sewing items; cotton buds, floss, and makeup brushes can all be corralled together with the use of a clean jar. Growing Sprouts and Herbs. Add a damp cloth to a glass jar, sprinkle in some seeds, and in a few days you’ll have tasty sprouts to top your soups and salads with. Glass isn’t the best for growing plants but in a pinch a jar is a simple way to grow herbs on your kitchen windowsill. Learn more about windowsill gardening. Displaying Flowers. A few sprigs of eucalyptus, picked wild flowers, or a gifted bouquet; a glass jar topped with water makes a simple vase for those of us who don’t buy flowers all that regularly. Propagating Plants. Keen houseplant growers will already know the trick of propagating plants in glass jars. Pop a stem in a jar, keep it topped up with water, and in a few days or weeks roots will start to grow. This is how you grow an avocado from a seed. How do you make use of your empty jars?